The Down-View Smoke Detector Hidden Camera works best when mounted to the ceiling, therefore, it can be installed in various locations, such as over a cash register or stock receiving doors. Every house, apartment and business should have a smoke detector (or two). 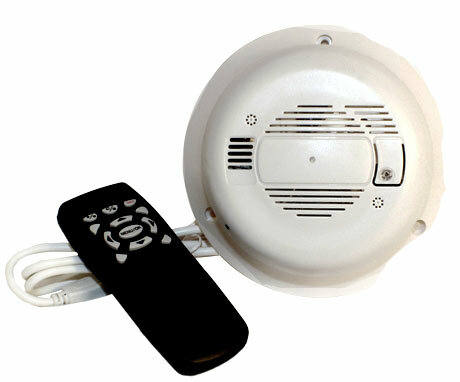 The Hidden Camera Smoke Detector/DVR Combination is a perfect solution for covert video surveillance. No wires to run or tricky transmitters to deal with...Just high-quality all-inclusive recording! Monitor cash registers, record office personnel, or monitor who comes and goes through the door. Mounts on ceilings or walls in minutes and can be moved to different locations quickly and easily. Please note that the smoke detector is non-functioning and cannot be used as a safety device. This hidden camera uses an internal DVR that features: motion activated and scheduled recording; motion detection area masking; time and date stamp; high, medium and low recording options; remote control operation; and MPEG4 file format and composite video output. No addiontal software is required. To control the features simply plug the camera into your TV, using the included RCA cable, point and click. Includes: Fake Smoke Detector, User Manual, 8 GB SD Card, Remote Control, 2 AAA batteries, RCA Cable for testing. This Down-View Smoke Detector Hidden Camera can be delivered in 3 to 5 business days. If you would like to receive your order sooner, guaranteed 3 day, 2 day and next day delivery options are available upon checkout. Orders placed by 2:00 PM central time ship the day they are placed. If you have any questions or concerns call our customer support staff at 800.960.2015 or click the live chat button at the bottom of this page. Our courteous and professional customer support team is always glad to help! Being all four of the models above utilize your computer as the DVR., if your computer is connected to the internet, you can generate a live feed over the internet (requires DSL or cable internet - will not work with dial up connections). You would be able to simply pull up a website address and view what is going on in the room live, in real time. If you are interested in any of these models, please call us at 800.960.2015. We will be glad to tell you more and take your order over the phone.